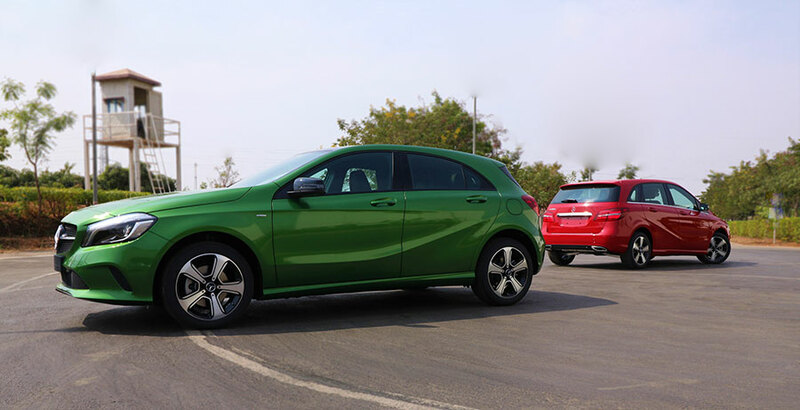 India’s largest luxury car maker Mercedes-Benz India today strengthened its New Generation Cars portfolio by launching two stunning luxury compacts – the A-Class and the B-Class ‘Night Edition’. With the launch of these splendid luxury compacts, Mercedes-Benz India offers a versatile range of products aimed at the young, successful and dynamic customer base, which has increasingly been preferring a Mercedes-Benz. These new generation cars (NGC) personify the brand’s hallmark emotive appeal of sporty performance and enhanced comfort. The A-Class and B-Class ‘Night Edition’ are designed for the ‘go getters’ who believe in arriving in style wherever they go. The A-Class and B-Class ‘Night Edition’ was launched by Roland Folger, MD & CEO, Mercedes-Benz India. We are glad to remain the most preferred luxury car brand in India and we begin this year in style, by launching two products in the segment we have pioneered, ‘compact luxury’. The trendy and fashionable A-Class and B-Class ‘Night Edition’ are a synthesis of youthful design that emulates modern luxury without compromising on performance. We believe our New Generation Cars play a key role in attracting dynamic, affluent and young Indians to the brand and this success story will be further amplified by the launch of the ‘Night Edition’ variants. As the most progressive models in the compact luxury segment, the A-Class and B-Class have been instrumental in making brand Mercedes-Benz more youthful. Both these cars truly embody the changing preference of the youth in today’s social milieu, which increasingly prefer compact luxury. With the new A-Class and B-Class ‘Night Edition’, we have just raised the bar even higher for this popular segment. We are confident that these stunning compact luxury vehicles will remain the first choice for those customers, who desire sporty design, topnotch interior coupled with class leading performance, world-class infotainment system and uncompromised safety features. 7-speed dual clutch automatic transmission (7G-DCT): The dual clutch transmission combines the comfort of a 7-speed automatic transmission with the driving dynamics of a manual transmission. The 7G-DCT consists of two sub- transmissions, one of which transfers the tractive power to the wheels while the other is pre-selecting the next gear. This leads to fast, smooth gear changing without any interruptions in tractive power and results in improved acceleration. Striking lines, dynamically curved surfaces and coupé-like window lines characterize the new exterior of the A-Class, following the design philosophy of sensuous clarity. The Night package offers striking exterior features to lend the vehicle an expressive sporty character. Selected design elements in black, including the exterior mirrors, the high-sheen 43.2 cm (17-inch) 5-spoke light-alloy wheels, the high-gloss beltline trim strips and the high-gloss trim in the front bumper and rear bumper. The new A-Class ‘Night Edition’s high-quality interior has been upgraded with plenty of attention to detail which enhances its sporty look and feel. Contours, surface finishes and materials combine to create a harmonious whole which delights both the eye and the sense of touch. The new A-Class is equipped with a leather wrapped multifunction steering wheel featuring a 3-spoke design with 12 function buttons as well as a shift lever in leather. As part of the Urban package, the ARTICO man-made leather and fabric sport seats assure seating comfort while at the same time giving the interior a sporty touch. An even larger, brilliant colour display is offered by this frameless, free-standing 8- inch media display. The screen diagonal of 20.3 cm (8 inches) is 2.5 cm (1 inch) larger than the standard display. With this feature using Apple CarPlayTM and Android Auto, compatible smartphones with the corresponding operating system can be integrated into the vehicle and operate them by voice control, for example. The system supports the major applications and selected apps including navigation. The Night package offers striking exterior features to lend the vehicle an expressive sporty character. These include selected design features in black – from the light- alloy wheels and exterior mirrors through to the beltline trim strip. Selected design elements in black, includes the exterior mirrors, the high-sheen 43.2 cm (17-inch) 5- spoke light-alloy wheels, the high-gloss beltline trim strips and the high-gloss black trims on the front bumper and rear bumper.